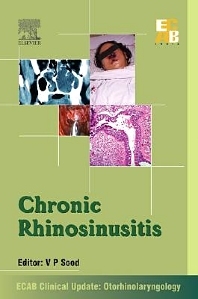 Chronic rhinosinusitis is a widely prevalent condition globally as well as in India. The chronicity of the condition and its multifactorial origin makes the detection of the underlying mechanism of the disease difficult to detect and renders the management challenging. This clinical update handbook put together by the eminent exponents of otolaryngology in India aims to simplify this elusive condition for the benefit of all practitioners involved in the management of this disease. The first chapter highlights socio-economic burden and the impact of this disease on the health related quality of life. The second chapter describes the underlying mechanisms involved in development of the disease. The third chapter showcases the various diagnostic modalities used to detect the disease, differentiate it from other similar conditions and assess its severity. The fourth chapter gives a very succinent overview of the various management modalities. The fifth chapter encapsulates the medical treatment and the sixth offers a lucid description of the latest surgical techniques for this disease. The seventh chapter deals with the other associated conditions that can confuse, complicate or impact the management of the disease as well as affect its prognosis. The eighth chapter describes fungal rhinosinusitis, which is of special importance because of its high prevalence in India.